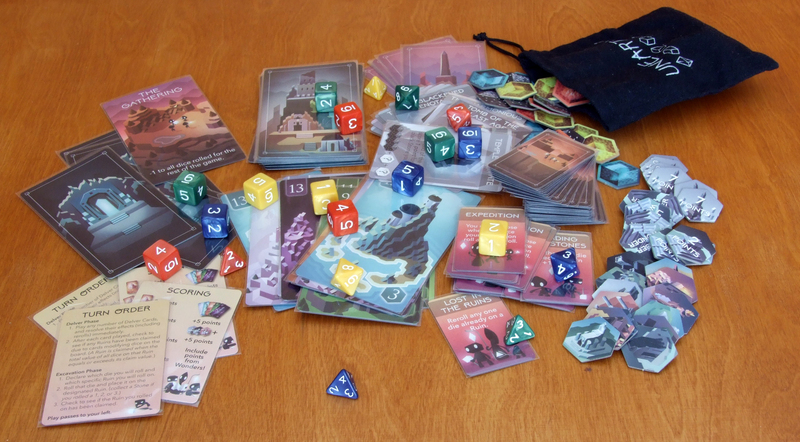 In 2017, Brotherwise Games, publisher earlier known for Boss Monster, released the board game debut of Jason Harner and Matthew Ransom. 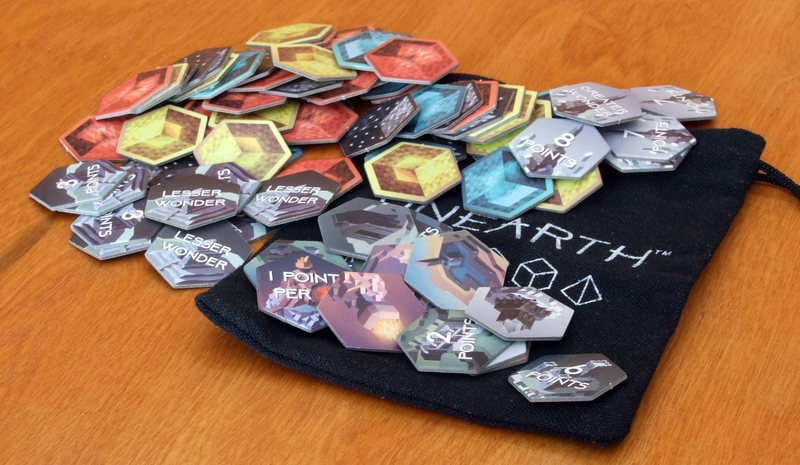 Graphics were taken care of by Jesse Riggle, the artist for whom Unearth is his first illustrated board game. Currently, you can get it on the manufacturer’s website. In a medium-sized box, we can find a well-designed, plastic insert. 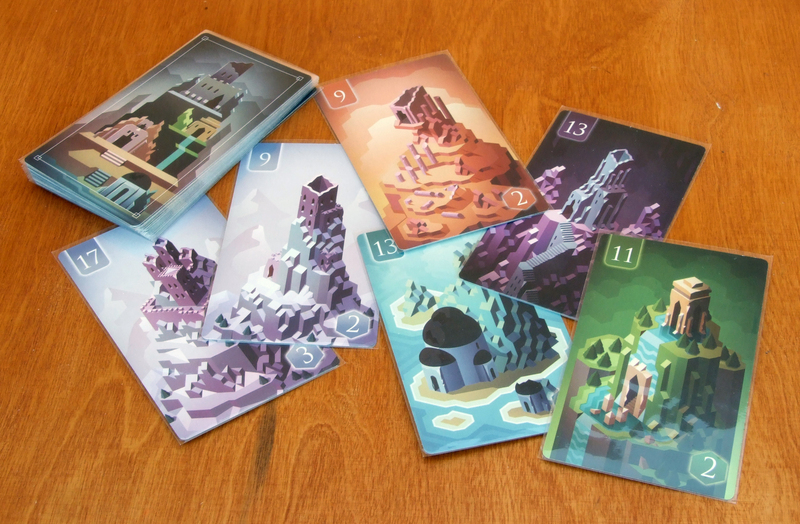 Each element will find its place there, and the cards easily fit into it while sleeved, leaving some space for possible expansions to the game. Among the components we will get 20 pearl dice in four colors. 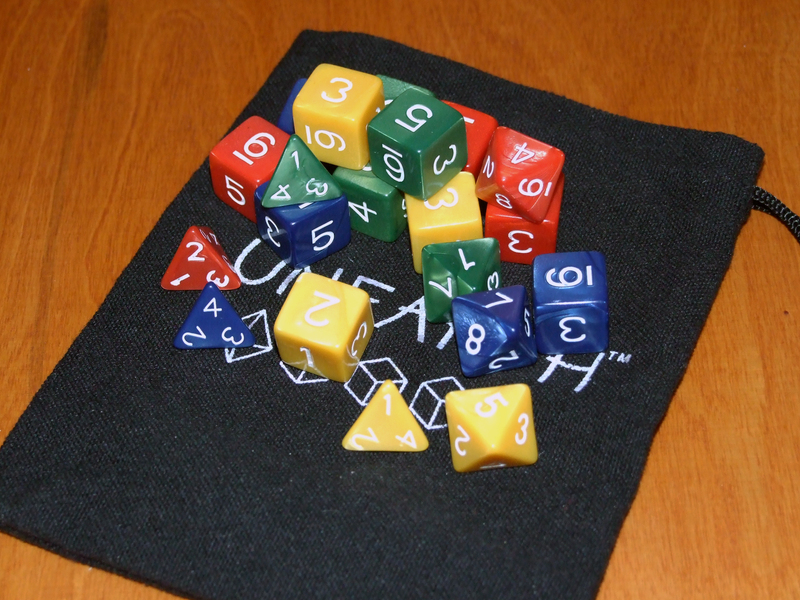 Each set contains three six-sided dice, one four and one eight-sided die. 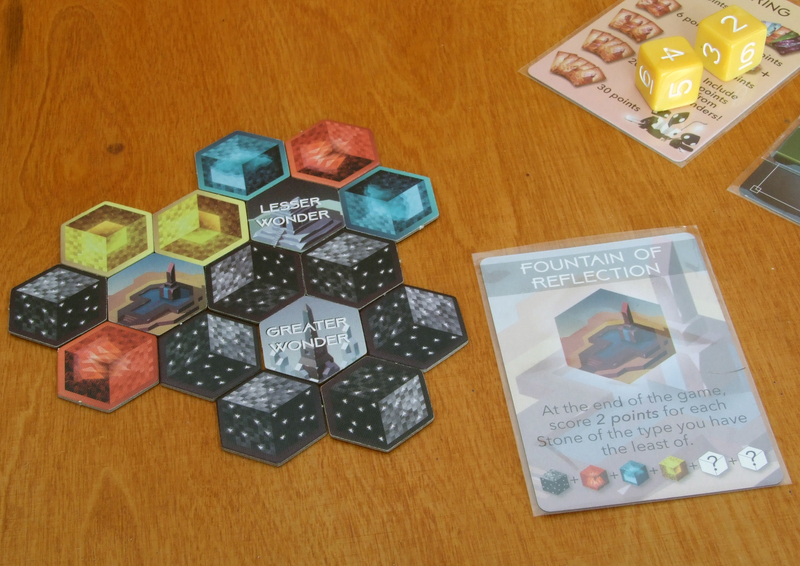 Next are 91 hexagonal tiles that include Stones, Named, Lesser and Bigger Wonders. We also get a cloth bag for Stones from which they will be randomly drawn. Finally, there are 4 decks of cards – Delvers, Ruins, Named Wonders and the End of the Age. The game was illustrated in a fairy-tale style. 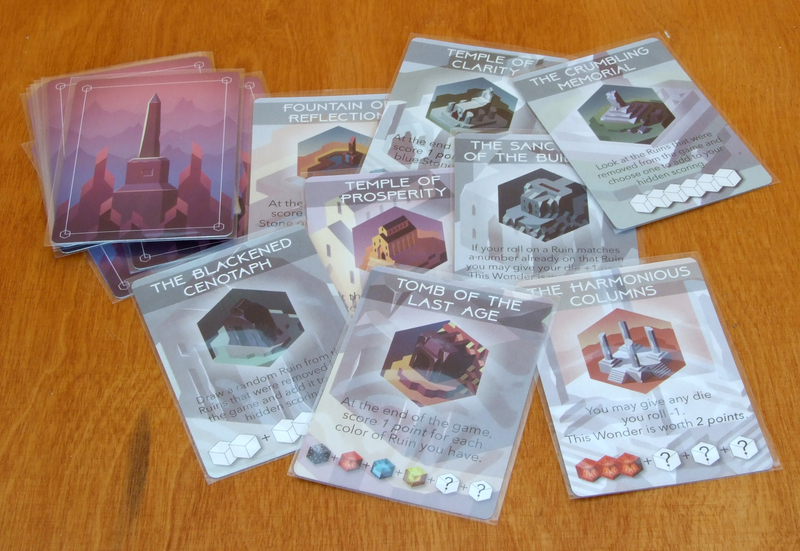 Each color group of Ruin cards contains consistent, climatic buildings presented in an isometric view, as well as tiles and Wonders cards. 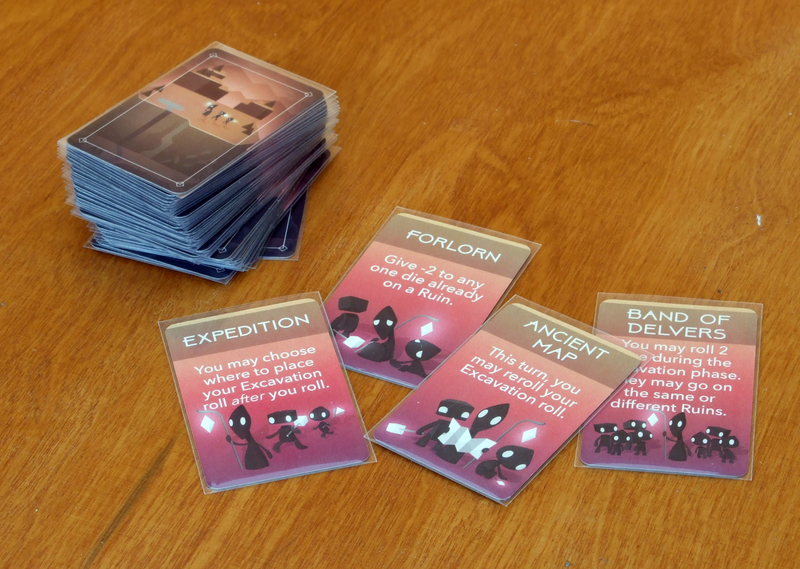 Charming silhouettes of tribe members in which we recognize our dice, illustrating the text of the Delver cards. The whole project captures the player and does not allow you to take your eyes off it, it is simply great. Each player takes on a role of one of the small tribes, which after years of forgotten cataclysm, tries to delve into the past and regain the ruined heritage. The civilization that has been ruined, may emerge from the ruins for which we will fight against each other, and the stones of these ruins will serve us as a foundation to build new wonders in the race for former glory. While the theme of the game makes sense and is reflected in the mechanics, it is rather a secondary element. Another story could work just as well if it were to be supported graphically. The question is whether the graphics would be as good and endearing as the one for the ruins we unearth. In this case, it is an element that holds the player on par with mechanics. The goal of the game is to collect as many victory points as possible. 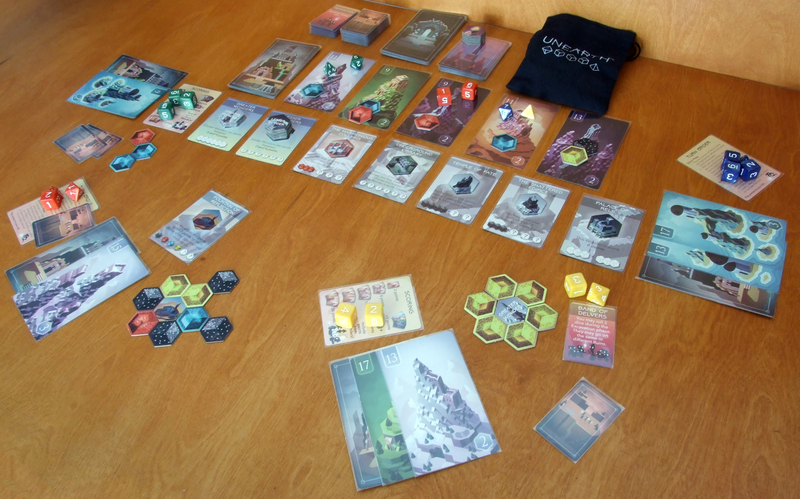 The turn of the player is divided into two phases: an optional one, in which we play Delver cards allowing manipulation of dice and obligatory “Excavation”. In the second phase, we choose a die from our tribe, choose a Ruins card that we will dig and throw it. The results of 1, 2 or 3 give us a stone tile for the construction of a Wonder, the other results are count to let us obtain the Ruins card. Each time we finish the ring from the stones obtained and it meets the requirements defined by a Wonder card, we can build it. Built Wonders and collected Ruins cards give us victory points. Because of the dice, the game is random, but there are many possibilities to manipulate the results. By properly calculating our capabilities and adjusting the strategy to the current situation, we will virtually always gain something during our turn. The mechanism of compensation, when someone snatches a Ruins card that we invested in our dice, is to give us more Delver cards, and these properly played can quickly take us to the leading position. 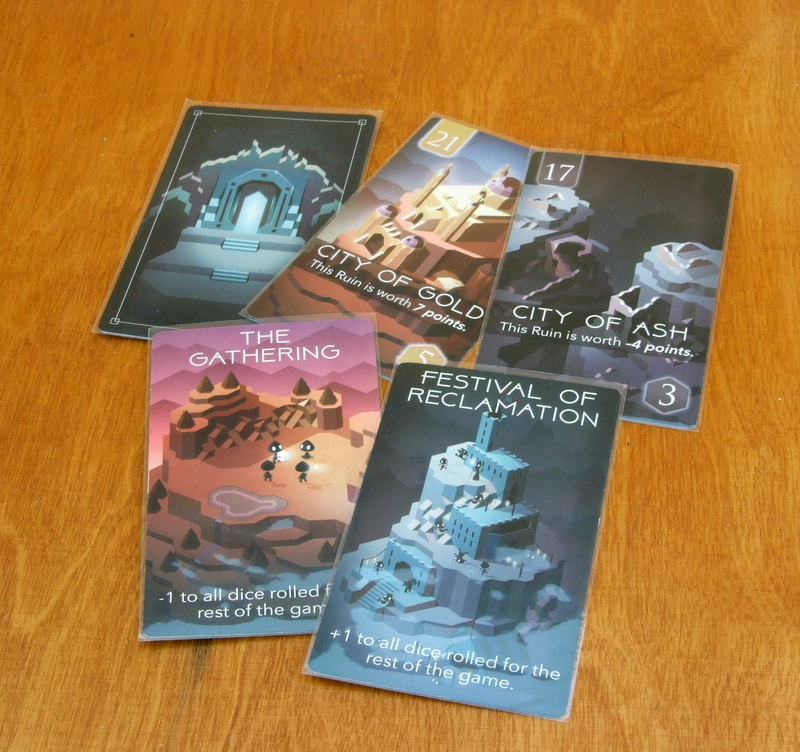 Ruin cards are more valuable in points, Wonder cards give us less points, but they give our tribe new skills to influence the dice results – it depends on us, what strategy we use in the race for the win. Flow of the turn is quick and smooth. And an unknown End of the Age card, discovered near the end of the game, slightly changes its rules adding replayability. You must have it. In my opinion, Unearth is one of those games that should simply be in the collection. I played this title with both the casual and advanced players, or with newcomers just getting into the world of board games. There was not even one person among them who would say no to it. The rules are explained in less than 5 minutes. Regardless of whether we play in two, three or four people, the playing time fluctuates within 30-40 minutes. The spectrum of possible approach to the game is wide. All this stands for universal character of this game and the possibilities of playing it with everyone. 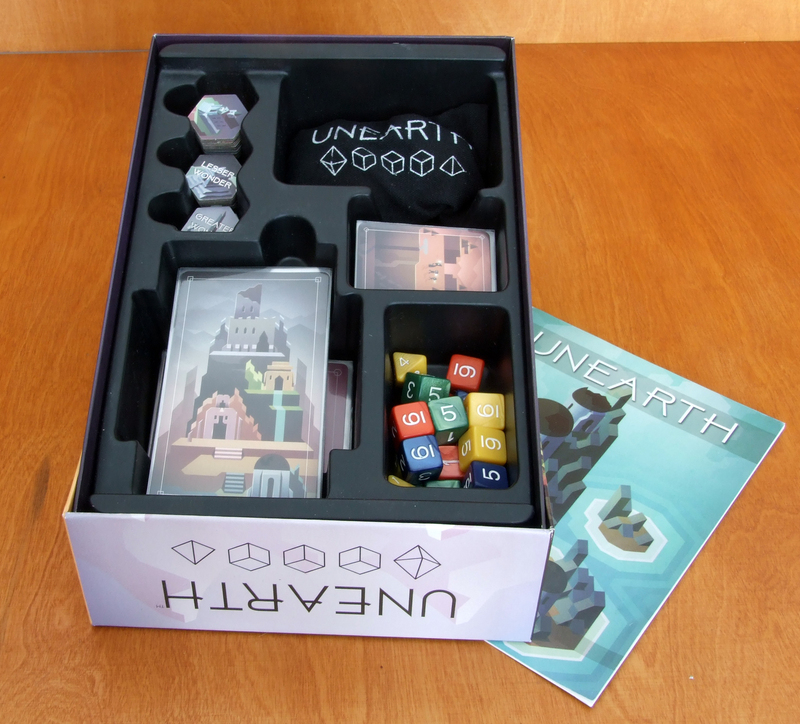 The last advantages of Unearth are for me its openness to expansions (additional cards or sets of dice for players) and the flexibility of rules allowing the introduction of new variants of the game. A perfect combination of mechanics and the appearance of components is a reason for me to say that this is a sure-fire hit.